This time round, the sum total of votes to the Opposition Presidential candidates could even exceed 65%, but this may not be of much advantage, first that it will surely call for a re-run which will eat much more into the coffers of the badly impoverished Uganda economically. The Voters have one workable solution, and that is to single out one Presidential candidate who can lead the desired change and a credible candidate with international connections. The candidate who should be given bigger consideration is Dr. Olara Otunnu who surely is least likely to abet Human Rights abuses given his record as a career diplomat and the man who wishes to maintain credibility. It is also true that Otunnu can manage to get solutions to the possible tricks the NRM may wish to play as it has always done and hence ensure that it remains entrenched in office. We the voters need to think beyond our noses if we want to see a better country. It is true that each of the candidates has his/her supporters but merely voting for each one's supporter will take us back to square one. It is true that if Dr Otunnu is the favourable candidate for the Presidency, he will not get majority Members of Parliament from his party, and this means alot of compromises which is not bad for Uganda, as dictatorship or using the numbers which NRM is found of doing will not be applicable in Otunnu's case, and this means that if the electorate get the best representatives at Parliament level, lively debates then may help the country to move from the current uncertain future the NRM has put it in. We have one big drawback, and that is the way voters have been corrupted by candidate Museveni's hand outs, favours, promises name it; which makes candidate Museveni to get convinced that he has the sure win given the favours to these people; which deprivation unfortunately is blamed on his misguided leadership which has thrown majority of the people into poverty and that wish to wait for hand outs. 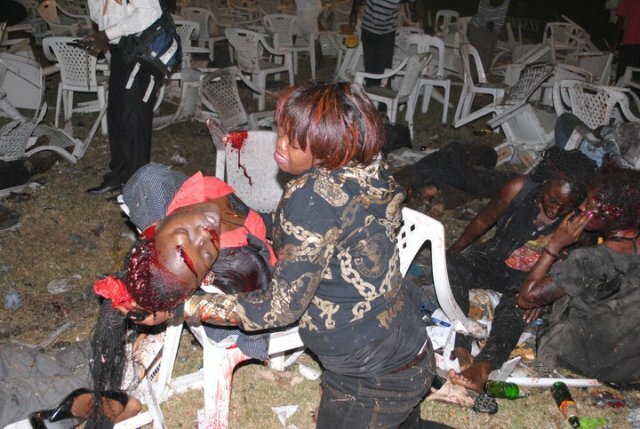 KAMPALA BOMBS ARE PART OF THE BIG PROBLEM OF UGANDA'S INVOLVEMENT IN REGIONAL POLITICS YET WHEN IT IS A POOR RESOURCE COUNTRY. VOTING PRESIDENT MUSEVENI IS GUARANTEE THAT WE ARE STILL WITH THIS PROBLEM FOR SOME TIME! 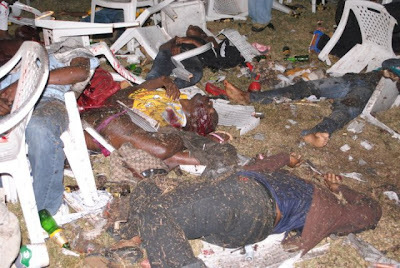 It is sad but real that life of more than 70 people could be lost through bombing them on having turned up to watch the finals of the World Cup! 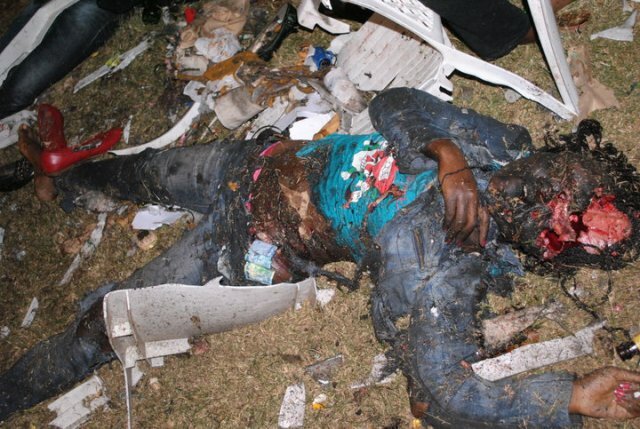 The death toll following Sunday night’s bomb explosions that ripped through a city restaurant and sports club climbed to 74 yesterday, as reports trickled in that the Somali Islamist militia group, al Shabaab had claimed responsibility for the attacks. President Museveni yesterday visited the scenes of bomb blasts in Kampala, offering public support to the families of the victims and vowing to track down the terrorists. Mr Museveni’s comments were tailored to show strength at a time of great distress, and he sometimes invoked his own personal story to inspire fortitude. 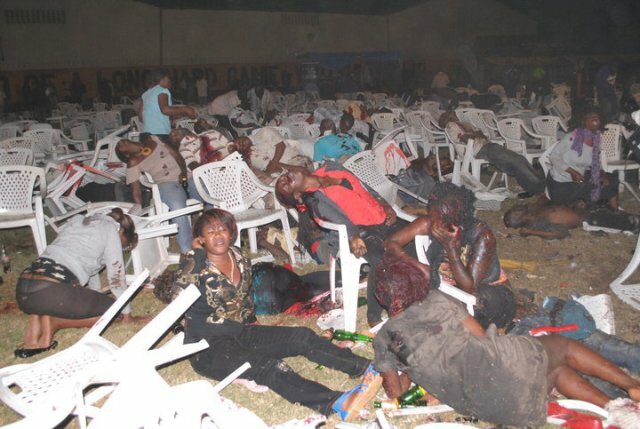 “I wish to condemn the criminality of these gangs,” he told a crowd outside the Kyadondo Rugby Club, a scene of death and flight after two explosions ripped through revellers watching the World Cup on giant screens. Mr Museveni stuck to this message of courage in a time of need throughout his public speeches, first at the Ethiopian Village in Kabalagala, the other place targeted by the terrorists, and then at Mulago Hospital, where he visited the casualty ward and the surgery. In the casualty ward, when he was asked by some of the patients to strengthen security in the city, he expressed his sympathy and vowed to “arrest” the perpetrators of the attacks. Mr Museveni’s tour of Kampala also led him to Christ the King Church, where he spoke firmly against terrorism in a tribute to Brig. Police chief Kale Kayihura told reporters the attacks were definitely the work of terrorists, but that he was not ruling out anything when it came to who could be responsible. The police said last night that reports of more explosions in the city and reports of a bomb found in a house in Makindye, a city suburb, were false. 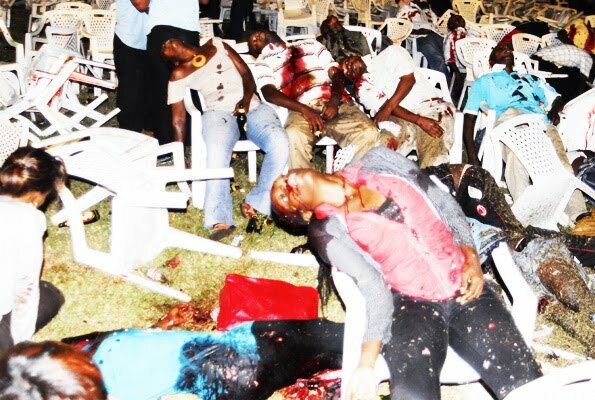 Scores of Ugandans were by 6am yesterday camped at Mulago to receive what could have remained of their loved ones. Weeping women welcomed you at the entrance to Mulago’s casualty ward while Red Cross staff swung into action to help save the dying. The mood was of uncertainty. Whenever a car pulled into the casualty parking lot, everyone stood to take a look at what it contained. Most stood in small groups whispering to each other, probably speculating about who could have done such a terrible crime. Three white papers with 58 names hung on a pillar, directly opposite the casualty police post’s blue unipot. On them, inscribed in ink, were names of the admitted, their age and where they lived. Two of them, Joan and Emilly Aristater were from Pennsylvania in the USA. People queued to view the names, some left smiling; their people were still alive though in pain. The majority left the pillar crying out loud, on their way to the mortuary section. Only one person was indicated to have died upon arrival. By midday, as State Minister for Health James Kakooza addressed the press at the ward, five had died upon arrival. An old woman dressed in a gomesi refused to talk to anyone. She only kept talking about her three children whom she had not seen. The smell of urine and blood filled the 9am air. Nurses, doctors and traffic police manned the gate to the mortuary jealously. No medical person dared talk to the impatient crowd. They were always in a hurry, speaking on mobile phones as the angry relatives hurled insults in their direction. Some people had carried coffins. But by 4pm, none had been used. A woman, probably in her late 30s, cried endlessly until security held her tight. She kept murmuring the name Muwanga; he must have been the husband. “In all men here, I do not see Muwanga. God what did I do to you?” she kept asking. 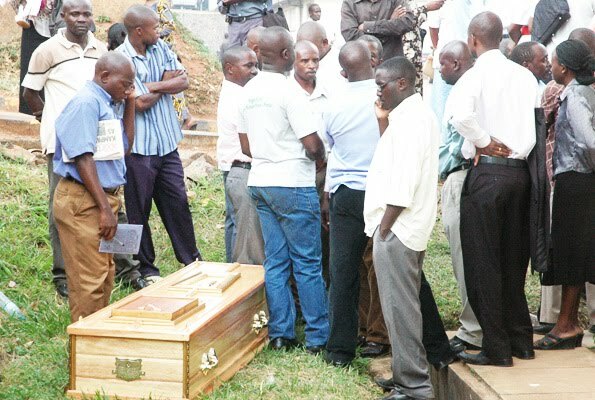 Betty Aliedo was at the mortuary to find her young sister, Jean Vicky Ariakot, after a photo of a woman wearing clothes similar to hers (Ariakot) appeared in Daily Monitor. Ariakot was in her Senior Six vacation. “I can not believe she is gone...” is all she said while clutching at the metallic gates of the mortuary. MPs Joseph Balikudembe and Winifred Kiiza were also at the scene. They had close relatives among the dead and they would wait for the bodies. Your Excellency, Candidate "President Museveni, are you not worried about the "Open Forums" about you when you get out of power? 1. People wonder how generous you are that you could donate a whole equivalent to shs 190m (as alleged by Baby Cool) to him for treatment. How easy is it to be able to donate such money when you are able to keep within your benefits as Head of State, they would wonder. 2. 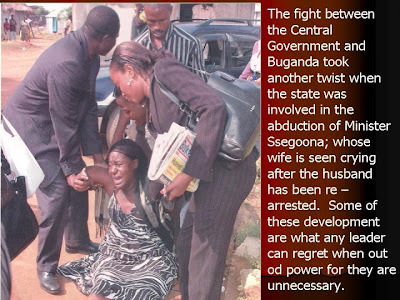 They would gossip about how the wife of the former (Late) owner of Bwebajja hotel could be co-owner of the hotel when she is ignorant about goods in safe custody in stores at the hotel which were only shown to her after the death of her husband. 3. They would gossip about the number of Commissions instituted by your Government whose outcomes have remained just to gather dust without action or exposure to public, not forgetting that there are some which did not take off like the kanungu massacre. 4. They would wonder how you schemed to carry on the various extensions in office including using the making of the Constitution as on option. 5. They would wonder how instead of creating conducive climate to see farmers market their goods , you miraculously donated to a chosen few shs 10m and to others vehicles to boost them under NAADS 'bona bagagawale'. 6. They would wonder how the army was able to spend billions of shillings while covered under 'security concerns not to disclose' the details pertaining to the particulars f the expenditures. 7. They would wonder how funds like those for rehabilitation of the Nakivubo Water Channel could have been used and yet flooding is still the order of the day. 8. They would also wonder how some bush war fighters overnight became billionaires by Uganda standards. 9. They would wonder how your Government was able to have dysfunctional planning departments or failed to implement the plans as drawn hence getting places to slums more so Kampala City, which has put the whole economy into a big mess. The issue of who will succeed President Yoweri Museveni as leader of the ruling National Resistance Movement (NRM) and consequently become the next Ugandan president continues to hang around despite efforts by the president to dodge or postpone it. 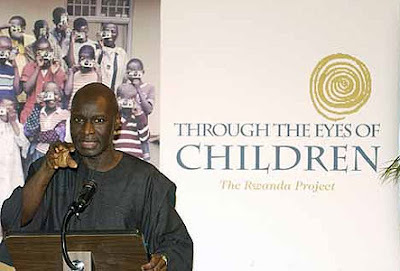 President Museveni's childhood friend Eriya Kategaya, who fell out with Museveni only to make a come back as the Minister for East African Affairs in the current cabinet, once said that he believed Uganda should follow the approach adopted in South Africa where Thabo Mbeki was chosen to lead the Africa National Congress well before Nelson Mandela's retirement from active politics. 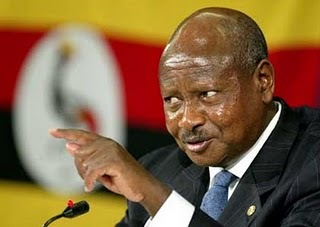 Until now, President Museveni has rejected this approach and his reluctance to discuss the matter, according to some political observers, fuels the suspicion by some people that even after leading Uganda for close to 22 years, he has not yet completely abandoned the idea of arranging another term of office for himself. 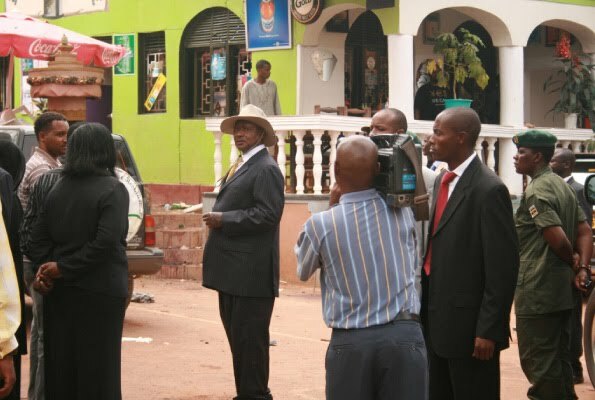 Barely a year after he was sworn in as Uganda's President for the third term, some politicians began to openly discuss the fate of President Museveni, come 2011. Some are pushing for his return and others are against it. This, to observers, is because nobody is sure of Museveni's next move. Kategaya wants President Museveni to name successor. That is probably why former cabinet minister Felix Okot, who wanted to replace Mr. Museveni as the NRM party president and candidate in 2006, is already warming for the same position yet again, while MP Kakooza is spearheading the campaign for Museveni's fourth term in office. The Ugandan Vice-President, Prof. Gilbert Bukenya, who was once seen by some as the likely successor to president Museveni, has repeatedly said he is not interested in the seat and still supports his 'boss'. While the president has not overtly shown his intention to stand down come 2010, he has named Prof. Bukenya and Mr. Amama Mbabazi, the NRM Secretary General and Minister for Security as Presidential material. 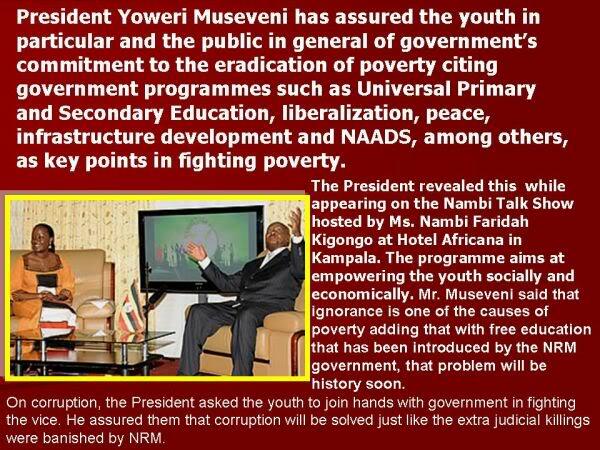 This is not strange coming from Mr. Museveni. More than ten years ago, Ugandans' minds were glued to the late James Wapakhabulo, who had already declared his interest in the presidency. Wapa, as he was commonly known, was probably the earliest front-runner waiting to take the baton after President Museveni, probably because of the impressive range of high-profile portfolios he had held in President Museveni's early government. 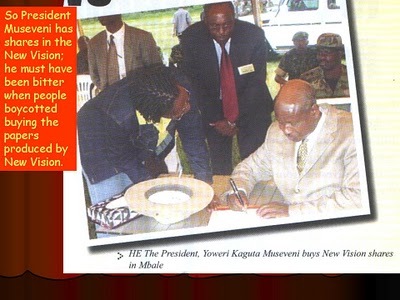 Some people believed that eastern Uganda was about to have one of its sons for the first time become the president of Uganda. These beliefs died along with Wapa, months after his popularity started waning. Succession talk was only rekindled in 2001 when Col. Kiiza Besigye, a young medical doctor who joined Museveni during the guerilla war of the early 1980s stood against his former boss for presidency. 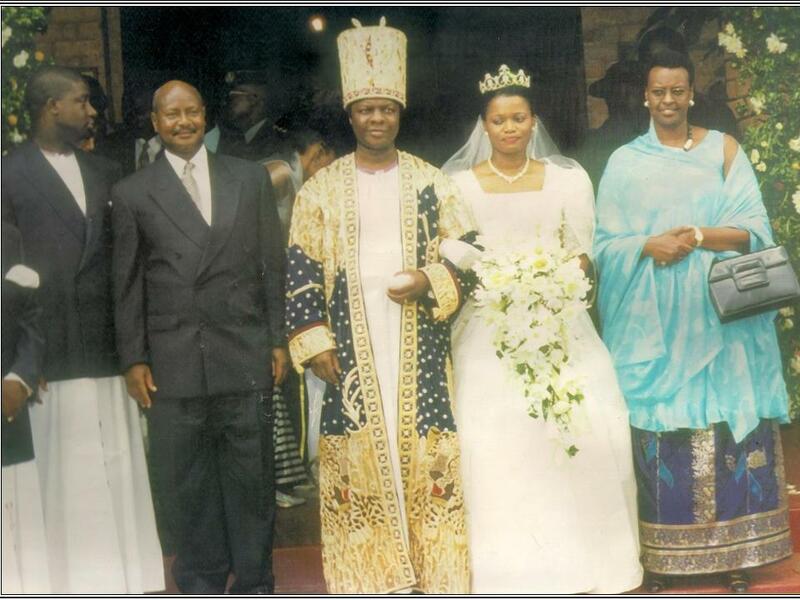 That is when the succession queue was first mentioned in Uganda's political circles. Mr. Mbabazi was displeased that Col. Besigye, now president of the main opposition Forum for Democratic Change (FDC) party, had jumped the succession queue by standing against President Yoweri Museveni. 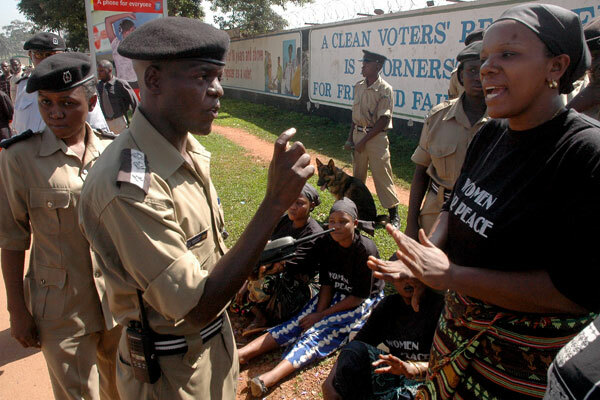 Besigye was backed by Reform Agenda (a political pressure group). 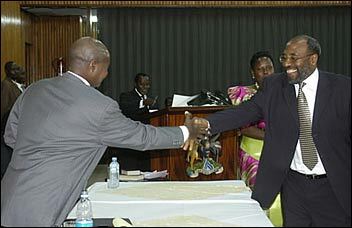 Reform Agenda was started mainly by aggrieved members of the NRM, most of whom sought change in the Uganda's leadership. A few years later, a group of Ugandan Members of Parliament mainly from the NRM, under an umbrella called Parliamentary Advocacy Forum (PAFO) merged with Reform Agenda to form FDC as a political party after the ban on political parties' activities was lifted. Many, if not most, of the members of this group were either known anti-corruption and anti-nepotism members of NRM or were tired of Mr. Museveni's cling to power. This weakened NRM and made the opposition stronger as former members of Mr.Museveni's political group not only ushered vigour into the opposition, but also geared for a fight using the information on NRM and their contacts. No presidential ambitions yet: Ruhakana Rugunda has remained loyal to President Museveni. Others preferred to do their fighting from inside NRM but later abandoned the party. Some are still reported to be doing so, including Hon. Felix Okot Ogong and MP Henry Banyenzaki. Banyenzaki has since teamed up with some other MPs to revive the Young Parliamentary Association, which was responsible for the creation of PAFO. Banyenzaki, who has been very critical of the Ugandan government, especially on its human rights record and respect for law, together with some young NRM-leaning MPs have teamed up with politicians from Uganda's opposition to achieve their objective. During a secret meeting at Uganda's Parliament building recently, Banyenzaki was elected the leader of the Young Parliamentary Association while Odonga Otto of the opposition FDC was elected his deputy. 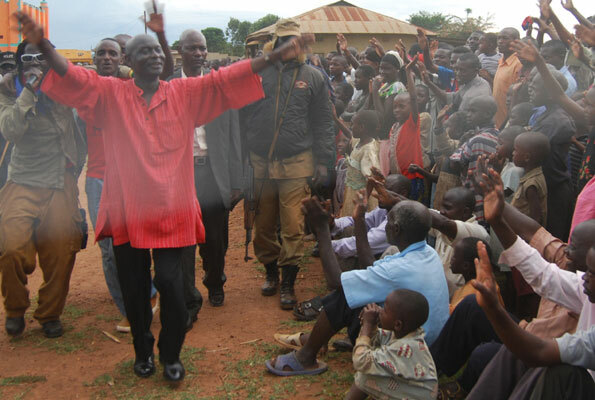 Observers say that this move could be geared towards forming another political party, since Odonga Otto cannot be counted as faithful to the opposition FDC anymore after he reportedly rejected some political appointments in the party. At the end of the day, it is NRM that could lose most if this political marriage is successful because even if Otto leaves FDC, he will remain a member of the opposition. On the other hand, losing Banyenzaki and his group will weaken the ruling political party. We should note that Banyenzaki is sympathetic to vice-president (VP) Bukenya rather than NRM Secretary General, Amama Mbabazi. A recent trip by Mr. Bukenya to Kabale, where he was received and accompanied by Banyenzaki reportedly annoyed Mr. Mbabazi who saw it as a 'marketing drive' by the VP in the Kigezi sub-region from which Mbabazi comes. A colleague at Ultimate Media Consult recently reasoned; "If you were Mbabazi and observed how vigourously Bukenya danced ekitaguriro (traditional dance of the Banyankore/Bakiga), with the Bakiga, you too would get worried." 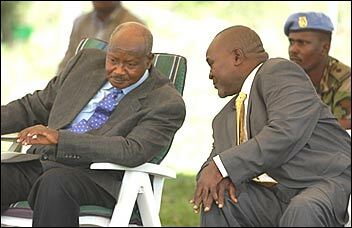 Uganda's political heavy weights: President Museveni consults his vice, Prof. Bukenya. Although Bukenya has continuously denied that he is interested in the Ugandan presidential seat, some observers believe he is doing it for tactical reasons to avoid conflicts with his boss, President Museveni. Through his poverty eradication campaigns, Bukenya is slowly but surely becoming a household name, something that could not be going down well with some NRM colleagues who also covet the top job. It is not surprising that the VP once told an official from a local daily about how a 'mafia' group within the ruling party was plotting his (VP's) downfall. Mafia talk seems to be gaining popularity at the moment. Any top gun in the NRM who gets problems points to a mafia group within the party. When President Museveni's closest military advisor, Noble Mayombo, died of acute pancreatitis earlier this year, the death opened a covert succession contest and the mafia group was again mentioned. 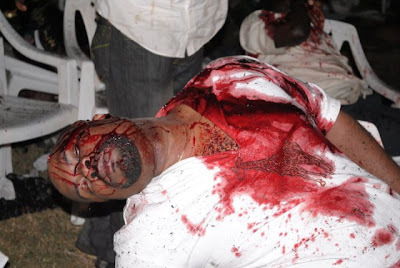 Mayombo was a top intelligence officer and private secretary to Defence Minister Crispus Kiyonga. 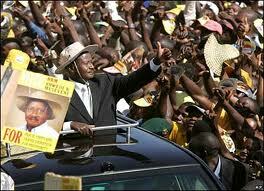 He was also widely tipped as President Museveni's most likely successor. It was widely assumed that he was being groomed to take over from Kiyonga enroute to presidency. 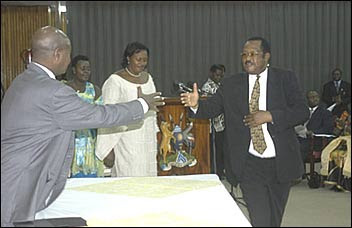 Some Ugandans believed that he would soon replace Beatrice Wabudeya as Minister for the Presidency, with the same eventual goal. His death raised political eyebrows even higher. Not so long ago, Maj.Gen. Kahinda Otafiire, another top NRM figure and current Minister for Local Governments drew political swords with Mr. Mbabazi in a bitter feud that could also point to deeper succession struggles within Uganda's ruling party. Otafiire, who in 2005 contested for the NRM party's powerful position of Secretary General and lost to Mbabazi, says Mbabazi is part of a group fuelling his current political headaches. Otafiire claims he is being fought because of the perception that he is against the political ambitions of Mbabazi and a clique working with him (Mbabazi). Recent media reports have claimed that Otafiire, former health minister Jim Katugugu Muhwezi and former East African Community chief Amanya Mushega held meetings to discuss who succeeds President Museveni. Asked by a KFM (Ugandan radio station) listener if he had any presidential ambitions, Gen. Otafiire replied; "Why should I rock the boat when we are still sailing in it? I weigh 96kg. Do you think I have grown this big because of this presidency?" Although many Ugandans seem to be worried about the current state of things, NRM party spokesperson Ofwono Opondo says that the tussle over presidential succession is healthy. "It is abnormal in a vibrant organization like NRM to miss such conflicts," Opondo said, adding that the party has the mechanisms to choose its leaders. We now have to wait for the year 2011 to see if this analysis turns prophetic. Wait a minute; this writer is not a prophet but an analyst. Lord, this time round help Uganda to get another leader who will give people hope so that they get out of the current situation which is unfortunate. Jesus our Lord in Matthew 21: 18 – 22 it is written that, “Early in the morning, as you were on your way back to the city, you were hungry. Seeing a fig – tree by the road, you went up to it but found nothing on it except leaves. 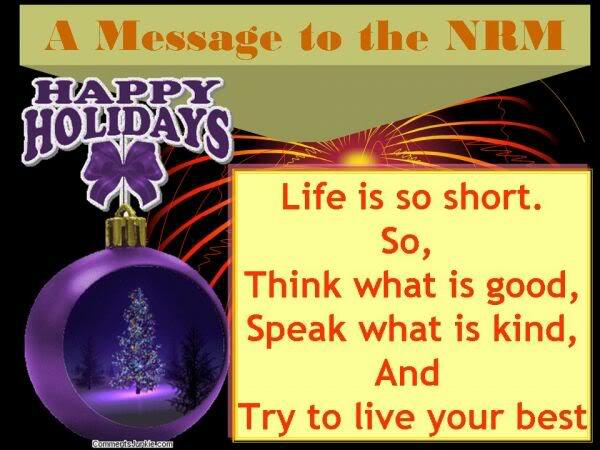 Then you said to it, “May you never bear fruit again! Immediately the tree withered. When your disciples saw this, they were amazed. How did the fig tree wither so quickly?” they asked. Good Lord, I pray that you give me faith so that my prayers to you can equally remove the problem of bad leadership our country Uganda is confronted with. In this prayer I appeal to your mercy that you inspire the Uganda voters to see the wrong, the deceit, the hatred, the lack of any sound future, the corruption, the source of suffering of the poor people of Uganda, and how they are used by the current leaders for the ends of the leaders as they are impoverished on. Dear Lord, you see the loans the country continues to borrow; these are to be paid by the impoverished poor and their children and grand children, yet the returns to these loans leave a number of questions unanswered. Good Lord, help the voters to see with their own eyes the ills inflicted on them and instead of taking them to be ‘normal’ fight them through the use of the ballot and give them the wisdom to vote wisely. I pray in Jesus name, Amen. There is enough time to process Voters' Cards for all eligible voters for 2011 General Elections. It is common knowledge that some parties have in past elections exploited loopholes hence leading to disputed results after voting. This time round, the Electoral Commission should not even mention that there will be voters without voters cards as there is no reason sound for it. All eligible voters MUST have voter cards, we are part of that backwardness where there is always a loophole to be exploited though funds may not be the constraint. Voter Cards and national identity Cards are two different projects and it is not known mandate at this time for the Electoral Commission to mix up the two as we know their mandate to deliver periodical free and fair elections not processing national ids or getting involved thereof. If the Commission does not have enough funds for the project, let them proceed with the exercise and meanwhile make an appeal to those good donors of ours to help out in the circumstances. Dr. Kiggundu should STOP shifting goal posts over issues that develop last moment. Given the experience the commission has, they should be ready to deliver the elections as required by law, and not come up with funny excuses of voters without cards; voters who are not on the register, nae them. We should agree on one or two things: That all Voters in the forthcoming General Elections MUST have Voters' Cards prior to voting; and all Voters to Vote MUST appear on the Voters' Register as minimum positions. If Ugandans fail to see the man God has put clearly out to salvage the failed state, then we can as well wait till Jesus comes back. It is true that the Late Dr. Obote made big mistakes in Uganda politics, however, we ought to greatly blame those who mis-advised the Kabaka of Buganda to take on the office of President of the country. Secondly, the move to kick off the central Government from Buganda land was a miscalculation. If those in the office like Mayanja Nkangi had better vision, the motion they would have passed in Parliament would have been to have Kabaka back to cultural roles. From the love relationship between some Baganda with President Museveni and his administration, it is quite clear that those people had they been with Obote that time, they would have sided with him. The eventual removal of the kings and the institution of the kingdom has affected us, but can you imagine that even after Baganda helping Museveni to wage his 5 year bush war on Buganda land and the people who died due to that cause, to-date 25 years down the road, the Kabaka of Buganda is not living in his official residence simply because the central government took over the official house of Buganda Prime Minister (Katikiiro). The central Government had a plan made for a replacement for the Katikiiro and to - date the residence has not been built as the central government decided to use the official residence for government business. 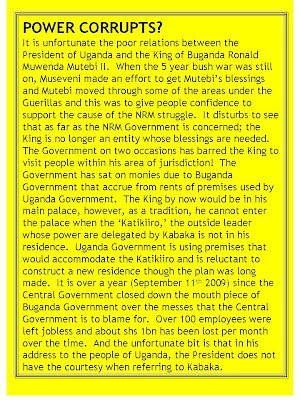 As if that is not enough, the central government deliberately decided to punish Buganda kingdom by not paying what is due to the Kingdom in rents which money among other things would help the Buganda Government to finance a number of projects to get the people in Buganda out of poverty including paying fees for many who are unable mainly because of President Museveni Government ill advised policies. The economy was running well infact it is Museveni's wish to be President of Uganda through waging wars and eventually insisting that he is the best brain to see the country move on that has grounded the country. 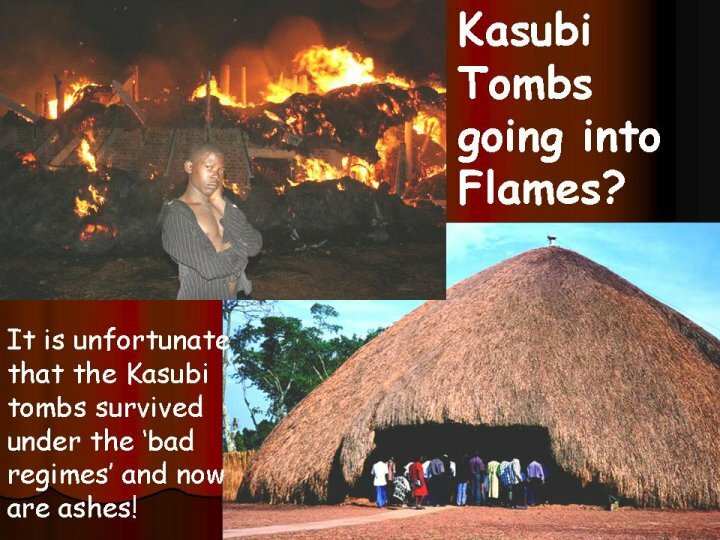 The fact is that a few people were directly inconvenienced when Obote removed the Kingdoms, but with the wish to rule the country up to when Jesus comes back as the resources including donor aid is eaten, Uganda has all people affected by the Museveni Government policies and the fruits of corruption will be paid for by a number of generations to come. I therefore wish to appeal to my good Baganda tribes men to re-think their strategy as regards voting for the man with the ability to take us a step further and the best option; that is Dr. Olara Otunnu. The blame of Obote on Otunnu will not yield dividends for Baganda or even Uganda. The harm President Museveni has done to Uganda makes many of us to believe that we should have been patient with the Obote regime somehow, the country would not be a big mess it is today. IN THE FORTHCOMING ELECTIONS, BESIGYE; MAO; KAMYA AND BIDANDI SHOULD BE NAILED TOGETHER WITH MUSEVENI. THEY ARE ALL UNFORTUNATELY IN ONE WAY OR ANOTHER RESPONSIBLE FOR THE MESS THE COUNTRY IS IN TODAY WHICH MAKES US CRY TEARS. 5. He is telling Ugandans that he is a clean man, yet it is almost impossible to be clean in a regime that has constantly deceived Ugandans. One thing is said today and tomorrow it is another story. He is collectively responsible for cabinet decisions made during the time he was minister in Government. WHY NO VOTE FOR MAO? He is simply too ambitious, cannot take advice, he is Mr. I know it all and his strategies would definitely 'crash' the country. He seems not to respect advice from elderly people and he is party to quick solutions to problems that require time in dialogue which has promoted divisions in the Democratic Party. 8. Dr. Kawanga Semogerere gave way to Besigye to contest for President as a joint candidate in 2001, but this time Besigye still sees himself as the man who should take Uganda a head yet he does not have what it takes to give the country new direction that is why he keeps shifting positions in his rallies so that 'miraculously' he can take more people on board. 5. Kamya seems not ready to blame President Museveni for his mistakes. She seems to keep shifting this blame to other parties. SO, VOTE WISELY; VOTE DR. OLARA OTUNNU FOR TRANSFORMING THE COUNTRY AND PUTTING IT BACK ON THE DEVELOPMENT LINE WHERE IT WAS BEFORE PRESIDENT MUSEVENI WHO CLEARLY SHOWS THAT HE IS READY TO RISK RUNNING THE COUNTRY ON WHAT HE THINKS IS POLITICAL SENSE TO SEE HIM REMAIN HEAD OF STATE VIS A VIS ECONOMIC SENSE TO SEE THE COUNTRY A VIABLE ENTITY AND PEOPLE A HAPPY LOT. Those who continue to vote the Movement are LOST SINNERS and they will not survive God's punishment: HELL. Some of he sins which the NRM has committed to the people of Uganda are outlined below. What to do then to reverse this situation? The answer is: VOTE Ambassador (Dr). 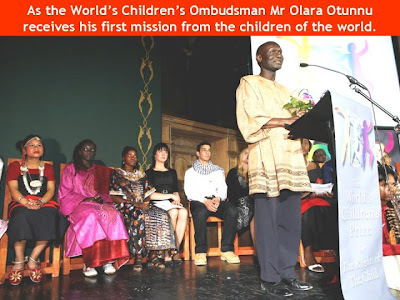 Olara Otunnu; the man who is not stained and who has the ability to turn the country around as the Pearl of Africa. When you vote wisely, the final resul of the vote should be as follows: 52% for Ambassador (Dr) Olara Otunnu. Those to vote for Dr Otunnu should include all those who have vision for a Uganda worth to be seen as a real Pearl of Africa. 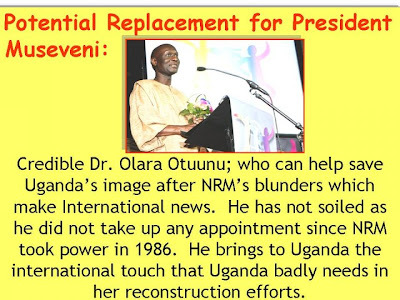 Dr. Olara Otunnu the man who has the ability to take Uganda to the Promise Land. When you Vote him you will not go to hell. v) The ignorant lot and those absolutely poor who will part with a vote in exchange of a favour say shs 5,000 or so which the NRM has had the history to dish out to 'buy' the voters. THE PEOPLE WHO HAVE UGANDA AT HEART SHOULD SEE LIGHT AND VOTE THE MAN WHO CAN TAKE THE COUNTRY FROM THE UNFORTUNATE SITUATION IT IS IN AS A RESULT OF THE POOR AND ILL ADVISED AND AT TIMES SELFISH POLICIES THAT HAVE UNFORTUNATELY RUN THE COUNTRY DOWN AND IT IS SOMETHING TO LAUGH AT AND CONTINUES ON BEGGING WHILE IT HAS ALL THE RESOURCES WHICH IF WELL UTILIZED CAN HAVE IT AS ONE OF THE PROGRESSIVE RICH COUNTRIES. Will a Loving God Punish Lost Sinners? To answer the above question, we should appeal to the BIBLE, GOD'S holy word. 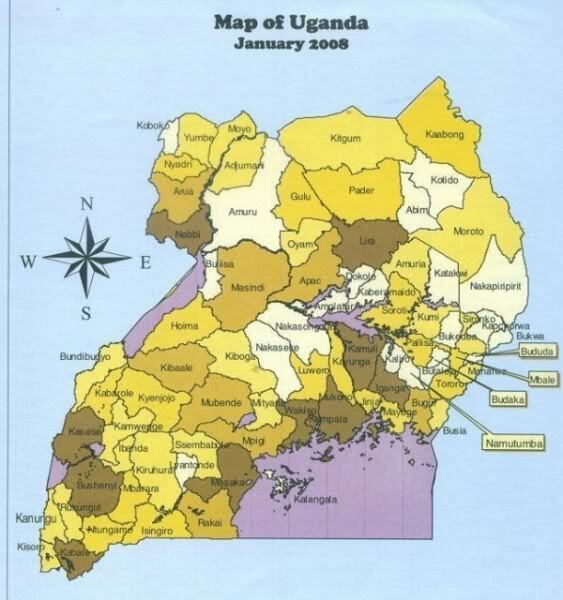 1) The Odoki Commission reported that over 60% Ugandans who responded to the type of Governance wanted a Federo system. President Museveni’s leadership instead opted for decentralisation which has not delivered what people want. Any pleas to have federo as a local government arrangement are simply ignored and alternative systems proposed. 2) Pressure on Buganda – In the past, there was near to balanced regional growth. Since the NRM got power, pressure has mounted on Buganda and Baganda have been made insecure as land is not readily available and very expensive. Yet those from other areas are dictating terms for Baganda in an attempt to safeguard investments made in Buganda. 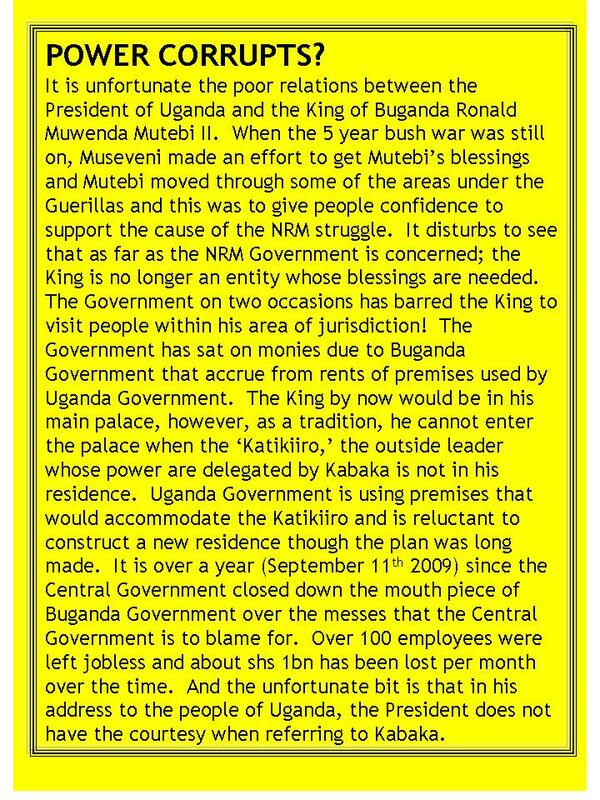 Kabaka Mutebi on two occasions has been barred by the central government to visit his people! 3) The refusal by the central government on two occasions to allow Kabaka Mutebi to visit areas within Buganda; an unfortunate development which is no credit to the central government. (2) Every Ugandan shall have the right— (a) to move freely throughout Uganda and to reside and settle in any part of Uganda; (b) to enter, leave and return to, Uganda; and (c) to a passport or other travel document. OK! How do we reconcile these provisions, specifically, Article 29 (2)(a) with the recent blocking of Kabaka Ronald Mutebi’s visit to Kayunga? 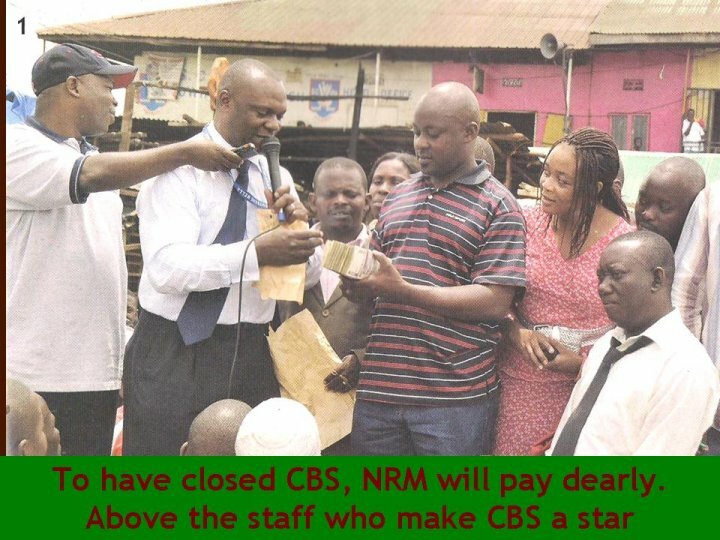 September 11, 2010 will be a complete 12 months since the NRM Government closed CBS FM which was earning about shs 1bn a month and employing over 100 staff! 4) The closure of CBS FM for a period over 8months now (in June 2010) as riots took off when people responded to the central governments’ action of blocking Kabaka Mutebi’s visit to Kayunga. 5) The reluctance by the central government to pay rent dues in time for Buganda properties rented; which is seen as a deliberate effort to cripple Buganda Government. 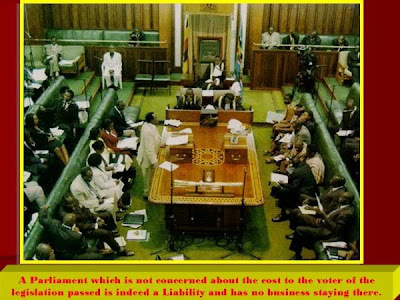 2) Through President Museveni’s influence as the major beneficiary, the 1995 Constitution of Uganda was revised and the 2 term limits were removed against the background that the reason for a maximum of 2 terms was against the bad history the country had gone through, and this amendment is opportunity to see the bad history become a reality again. "Four opposition parties: Forum for Democratic Change, Uganda Peoples’ Congress, Jeema and Conservative Party under the Inter Party Coalition (IPC) are planning to table before Parliament new constitutional amendments on Tuesday May 11. Among the amendments is a proposal to have two presidential term limits restored; disbanding of the current Electoral Commission and the removal of the army from Parliament. While addressing the media at Parliament, the acting Leader of Opposition, Kassiano Wadri said that the opposition agrees that the amendments are important especially as the 2011 general elections approach. Wadri says if the ruling National Resistance Movement government throws out their proposals in Parliament, they will not hesitate to take the matter to the Constitutional court for interpretation." "THE IGG has recommended the immediate sacking and prosecution of the suspended National Forestry Authority (NFA) boss, Damian Akankwasa, over the sh900m saga. The IGG made the recommendation in a report on claims by Akankwasa that his wife, Juliet Katusiime, stole the sh900m he kept in their bedroom last year. The IGG accused Akankwasa of abuse of office, failure to declare all his wealth and causing a financial loss of over sh2.8b to NFA through suspicious deals. The IGG suspects the sh900m could have come from such deals. In a May 7 letter to the water and environment minister, Maria Mutagamba, the IGG said Akankwasa made arbitrary decisions disregarding formal procedures." 11) Talk about corruption. Even AIDS patients have not been spared! The portfolio of Global Fund Grants to Uganda was worth US $ 367m including two grants to combat HIV/AIDS; two grants targeting Malaria and one of Tuberculosis. By the time of the suspension on August 24, 2005 only US$ 45m had been released of which it is believed about US $ 280,000 was fraudulently siphoned off! 13) Though the President boosts of an army which is professional, it is not clear why this army has failed to capture Joseph Kony who is at the core of terrorist activities in Uganda and now outside Uganda’s borders. "“Arrest warrants issued in 2005 by the ICC for Joseph Kony and four Lord’s Resistance Army commanders remained in force, but were not implemented by Uganda and other regional governments,” Amnesty International stated in its latest report. Kony’s commanders, who were indicted with him for atrocities during the northern Ugandan war, include Dominic Ongwen, Okot Odhiambo, Vincent Otti and Raska Lukwiya. Lukwiya has since been confirmed dead and Otti is also said to be dead. Uganda is a member of the ICC and is, therefore, obliged to arrest and surrender anyone named in an arrest warrant." 16) The Bush men were appointed into positions to manage public enterprises, and you can be sure that the wish to pay them selves for the contribution in the 5 year war of liberation and lack of managerial skills contributed to poor performance of most of them such that on privatization, the tax payer had still to shoulder a big burden yet even many of the beneficiaries were not able to see these enterprises run and as to whether all have paid up is not clear a position. 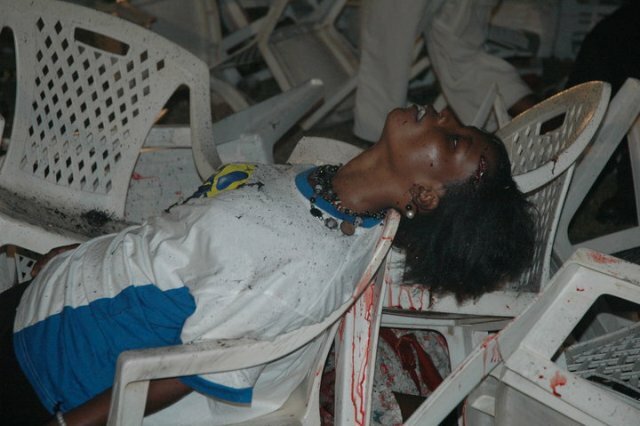 21) The unemployment levels of the youth are simply a scandal. While many in higher institutions are helped by relatives outside the country who have gone for greener pastures and a number are having bursaries by institutions, the Government has failed to be focused to see enhancement of employment opportunities for the youth. This is also against the background where vocational training is anon starter in schools such that students leave without employable skills for own job creation. "President Museveni has said that while corruption leads to wastage of public resources, it also has a good side to it. Speaking in Masindi last week, Museveni virtually defended corrupt civil servants and politicians, saying they also greatly contribute to national development by investing in the country money they swindle from public coffers. By thus investing, the President said, the thieves build the national economy. The President was presiding over the passing out of 238 Police officers who had completed a three-month operational commanders’ course at the Kabalye-based Police Training School. The graduands included 46 officers from Sudan. The opposition and donors have often criticised the Museveni government over what they see as lack of political will to fight corruption. The donors in particular have cited the misuse of money meant for the 2007 Commonwealth summit (CHOGM), and the Global Fund, among others, to make their point." MPs probing the Commonwealth summit expenditure have unearthed numerous irregularities in the awarding of the sh2.4b media and publicity contract. The contract was awarded to Saatchi and Saatchi and Terp Group during the preparations to host the summit in 2007. MPs on the public accounts committee yesterday discovered that out of the 17 companies that submitted their bids, 16 were disqualified because they allegedly had no trading licence, bid submission, certificate of registration, VAT registration or income tax clearance. They also discovered that although the evaluation committee had recommended the contract price of sh1.8b, the contract committee revised the cost to sh2.4b after adding one item. The MPs also discovered that the director of information at the time, Kagole Kivumbi, was the head of the user department, the chairman of the evaluation committee and the chairman of the negotiation committee. The MPs asked Kivumbi and the principal procurement officer, Margaret Meke, to explain how established companies such as Vision Group, Picfare, Sameer and the Uganda Publishing and Printing Corporation, could be disqualified on grounds of lack of trading licences. "Museveni says Africa needs help in areas of energy, roads and railway construction as well as in the education and health sectors but not political help. He says he does not need any foreign advice in organizing elections, an area that the development partners have concentrated on in the recent past, with calls for major electoral reforms. The President insists that he does not lecture on issues on which he considers himself an expert, urging them to divert their help to where it is needed." "It is not authenticated but a report purported to be by US Secretary of State Hillary Clinton to the American Congress on the 2011 Uganda elections could have serious implications. The report is the first in a series that the US Congress, in an unprecedented move, asked Clinton to write after every 30 days regarding the government of Uganda actions on the 2011 elections. 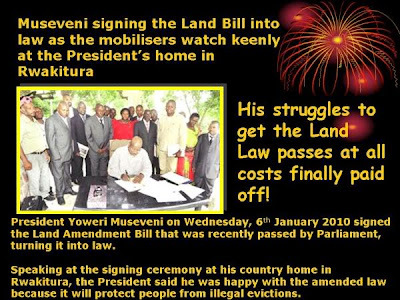 Congress’s directive was interpreted as a sign that the US is taking a hawkish view of the government of Uganda behavior and could take punitive action. There is speculation that if the does not carry out reforms to ensure free and fair elections, the US may cut its aid to Uganda and also influence other development partners to follow suit. The intention appears to be to nudge President Yoweri Museveni, who has been in power for 24 years and has won election mired by fraud and violence, to hold a clean election in 2011. 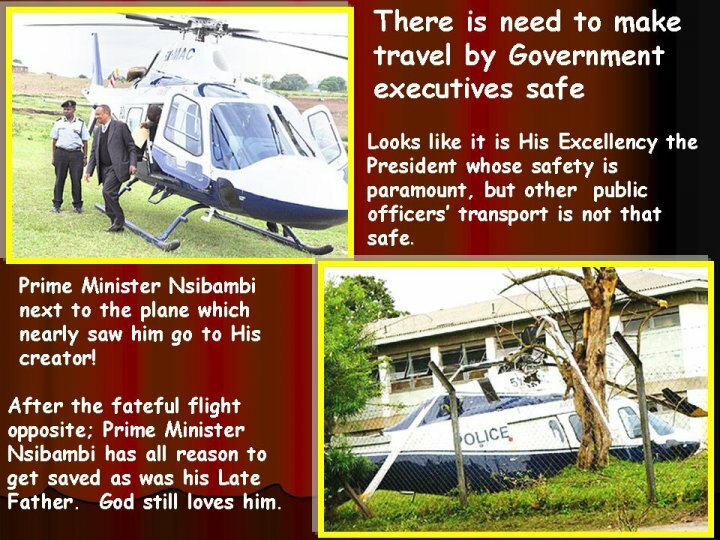 President Museveni’s special jet that has cost taxpayers Shs88.2 billion . The Gulfstream V was flown into the country last month. The Weekly Observer has obtained a photograph of the new jet No. N908GA 52008 taken on January 14, this year when it was returning from a pre delivery flight at Long Beach Airport in California. After that flight, the new jet was released to the buyer who is the Ugandan Government. The President’s Press Secretary, Joseph Tamale Mirundi, confirmed the arrival of the jet in a telephone interview Tuesday morning. The jet was purchased late last year to replace a Gulfstream IV which was bought at Shs60 billion in 2000. The State House Comptroller, Richard Muhinda, informed a parliamentary committee on presidential affairs that the old jet would be sold at about Shs40 billion. The planned purchase of another jet became public information in December 2007 when Muhinda and the President’s chief pilot, Maj. Gen. Ali Kiiza, briefed the presidential affairs committee on the state of the old presidential jet. Opposition MPs protested against spending such as huge amount of money while the old plane was still functioning properly. But the President’s team argued that the new plane would consume less fuel and would be cheaper to repair. 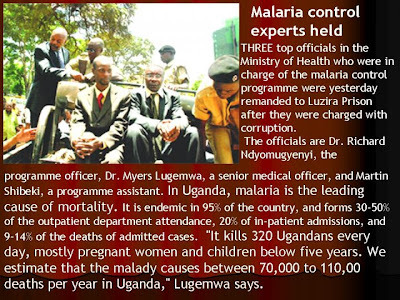 When Museveni came to power in 1986, he often spoke out against African leaders of poor countries who like to ride in presidential jets yet their citizens are infested with jiggers. Development partners share the concern of Uganda’s civil society and media about the increasingly high levels of spending on government’s administrative structures. These are resources that could otherwise be invested in infrastructure, basic education, health care, and clean drinking water for the poor. The sharp increase in the number of districts in recent years (and continued plans for new ones)diverts both human and financial resources from existing districts and undermines the capacity of local governments to effectively deliver services. Starting at 36 districts, 80 districts last year, and now 91 districts: who can make a serious case that this expansion of the number of districts is good for service delivery?” the World Bank Uganda Country Manager Kundhavi Kadiresan said at the National Budget Workshop by the Ministry of Finance, February 25-26, 2010. 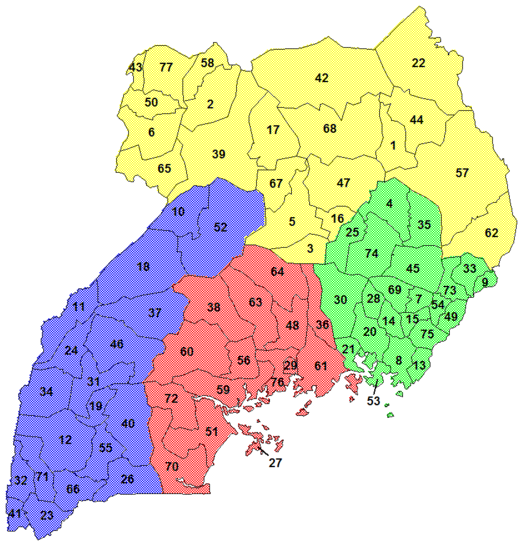 Despite the donors’ rage about Uganda’s high public expenditure, President Museveni has created 14 new districts, bringing the number to 111. The number is projected to reach 120 by 2011. In a 2009 paper, titled “The cost of public administration,” ACODE, a local think tank, says the “oversize cabinet and the growing bureaucracy built around the Office of the President” and the growing number of districts are the main threat to Uganda’s governance, efforts to eradicate poverty, and the achievement economic transformation." 30) President Museveni’s Government is witnessing a terrible scandal as cheating in national examinations is real. The private sector competition has led to the growth of cheating to see the schools that have bigger and better passes retain and or get big numbers, hence generate good income and profits. Refer to The New Vision, Wednesday, January 20, 2010: Over 1,400 results cancelled, "A total of 1,449 pupils will not receive their PLE results following their cancellation by Uganda National Examinations Board (UNEB). Seventy three schools had their results cancelled due to malpractices such as impersonation, external assistance, substitution, collusion and smuggling unauthorised material into the examination room. Commenting on the issue, Education Minister Geraldine Namirembe Bitamazire said: "Examination malpractice must be eliminated at whatever cost. We cannot let it continue. In 2001; 12,000 pupils had their results cancelled. The vice is coming back." 34) The way President Museveni’s Government unfairly treats some of the Presidential opponents is not a vote winner for the President; for him, it is a right to contest! 60) Yes, President Museveni, like anybody who stays long in a place, many people long to see a replacement that may do things differently, this category of voters wants to see change and are hopeful that change will a reality this time. 61) Government is very disaster unprepared. This starts with the budget which is small given the expected disasters. Government has not done enough to enforce building standards and hence a number of buildings can be a disaster anytime. Fire fighting equipment are just expected and hopefully they will be functional; but again in a number of places due to no planning, if fire breaks out it may be impossible to extinguish it. Kampala (Uganda) — The death toll from the landslides that struck Bududa district on Tuesday leaving hundreds of people dead or missing brings to question the effectiveness of country's early warning and response systems. 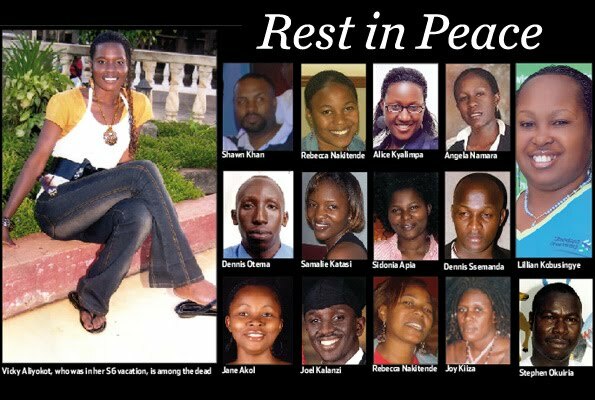 As the country mourns, this tragedy should be a lesson especially to the political leadership. They must re-evaluate the country's capacity to respond to disasters such as landslides and floods that are likely to be part of us for a foreseeable period as the effects of climate change take their toll. The death toll from the Bududa disaster would have been avoided if the Government and district officials had implemented 1997 plan to resettle the Mt. Elgon forest reserve encroachers. I had resigned over the issue of Presidency on seeing the it looked like a big game yet meaning a lot for the future of Ugandans to the extent that in coming 5 years the country can collapse completely given the projection for those who care about the country at all, not forgetting that there are some who want to eat it and see it completely collapsed and these can go with their loot! Surely, for President Museveni to be President for another 5 years is too much for me as one who has concerns for the country hence the reason why i wish to appeal to the citizens of Uganda and voters to do the needful so that we can see sanity return to the way public affairs can be run. We have in Government people who don't take any shame however shameful an act they do. We have people who see the country as a garden where they have to reap and constantly tell us that we did not fight. They went to the bush and now we can surely see the agenda which took them to the bush. They saw it as the means to have access to national resources as the majority are impoverished on. The pretence that they can do any more good given the bad inflicted so far to the people of Uganda can only be bought by those friends of ours who subscribe to lies and can not learn as well as those who are constantly looting the country as majority look on helplessly. Ugandans have to come up with a credible candidate who can meet the challange and is trustable. We are witnessing would be credible people switching to the NRM and you can not be convinced that they are not responding to some promises. For how long can we see our coutry go down the drain because some people threaten us with the military which military is paid for using tax payer resources? i was shocked to read a publication where people taking fish for export had to use the Nairobi airport simply because fuel is expensive making them lose money if they get cargo on plane at Entebbe. Surely can you sit in State House when your policies are making business uncompetitive? 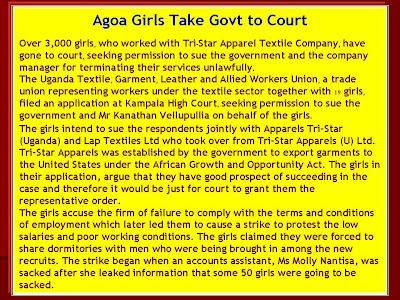 Why did Ugandans instead lose money in the AGOA deal which looks to have been in favour of some few. We will be cursed by our children if we cannot see facts and simply leave our country go to waste. Dr. Otunnu can help the country get back to the road to development and have people meaningfully earn money instead of having to go to banks and always be burdened by those bank loans when they can make meaningful savings out of agricultural and other enterprises in a vibrant economic situation. Let us vote wisely this time, we have the chance and the man to vote is Ambassador (Dr) Olara Otunnu. "One of the most cynical features of today's warfare is the way with which adults are using children to be the channel for their own hate and passion." Olara Otunnu was born in northern Uganda in a time when children went to school and had opportunities for a normal, rewarding life. Sadly, this is not the reality for most children in his home region today; nor is it the reality for far too many children around the world. 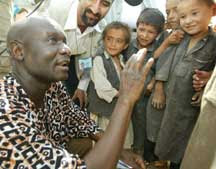 Otunnu has devoted his life to championing their basic rights. 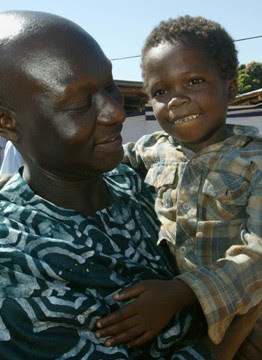 Otunnu had the opportunity of going to high school, college, and then university in Kampala, Uganda. Intelligent and eager to make a difference in the world, he earned an Oxford University Overseas Scholar followed by a Fulbright Scholarship to Harvard Law School. Afterwards, he practiced law in New York before becoming an Assistant Professor of Law at Albany Law School. 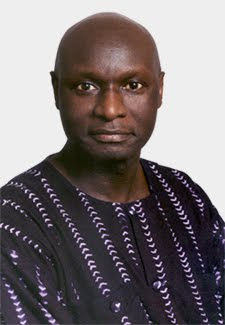 Otunnu was a student activist during his university years as president of the student's union, when Edi Amin had a terrible grip on his unfortunate subjects. After earning his degrees, Otunnu worked as a lawyer as well as a skilled diplomat; his awareness of the bleak plight of the children in his beloved Uganda compelled him to devote his life to improving their lives. When offered the position of United Nations under-secretary general and special representative for children and armed conflict, it was a perfect fit. He fulfilled this position from 1997 to 2005. Under his passionate and charismatic leadership, the United Nations crafted a comprehensive system of rules, called Resolution 1612 of 26 July 2005, in which an international monitoring and reporting system was established. The system "documents abuses against children, seeks to identify and publicly list offending parties responsible for abusing and brutalizing children, and seeks to bring these offenders into compliance with international laws and standards, including through the imposition of sanctions." "from Colombia to Sierra Leone, from Sri Lanka to Sudan and Uganda, from Burma to Angola. Compelled to become instruments of war, to kill and be killed, child soldiers are forced to give violent expression to the hatreds of adults. It is not just the child combatants who are affected, but the girls who become 'wives,' the youngsters who have to cook for the troops, be messengers or spies." 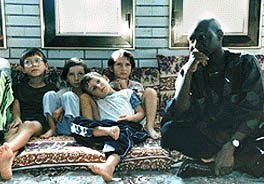 Otunnu spoke at the World Council of Churches, February 2006, where he laid out the progress made in the United Nations regarding this seemingly intractable affliction. After tireless observation, research and planning, Otunnu may have cracked the conundrum of why this urgent problem has persisted for so long, with so little action taken. He broke the problem down into these active steps toward hope. 5. 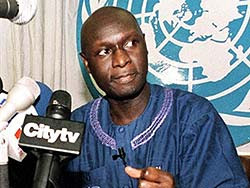 Simply put: Otunnu laid the groundwork by speaking out against the shame of treating children this way; he brought organizations together to take action; he decided how to assist government agencies to transform from talk to action (the most difficult step of all); the first concrete step was in publicly shining the spotlight on those who transgress; specific action plans and deadlines for ending the violations were implemented; in the event of noncompliance, the "Security Council will consider targeted measures against those parties and their leaders, such as travel restrictions and denial of visas, imposition of arms embargoes and bans on military assistance, and restriction on the flow of financial resources." Olara Otunnu has left an immensely important legacy during his United Nations sojourn - one that will save the lives and futures of thousands of children. 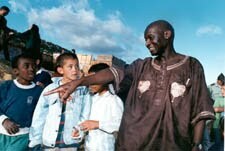 Today, his work continues through the LBL Foundation, whose mission is to encourage investing in the education of children and youth, as the "most effective way to facilitate overall recovery and development in a war-torn society." "Ensuring protection for our children and investing in their education and development is therefore among the most important and effective means for building durable peace and justice in society. Northern Uganda Social Action Fund (NUSAF II) a loan of US$100m from the International Development Agency (IDA) to be used for a period of 5 years was approved by the Association of the Board of Directors of the World Bank on May 28, 2009 and by the Parliament of Uganda on September 25, 2009. This loan designed to continue with the development effort for Northern Uganda after the conclusion of NUSAF I could easily be used by the NRM to induce votes for President Museveni. The people ought to be told the truth about this money. i) Public works which is to cost US$20m. This will be given to able - bodied people who can do manual work. ii) The US$40m to be given to people who are unable to do public works as the elderly and the handicapped. 2. The Community Infrastructure Development worth US$30m. The funds will support infrastructure like schools, health centres, and water. 3. Institutional Support worth US$im to be given to IGGto facilitate sesitization programme and the balance of US$9m to be retained by the Prime Ministers' Office to facilitate monitoring and other management functions. When I was a child, I used to do things childish. When I grew up, I ceased the childish mentality. 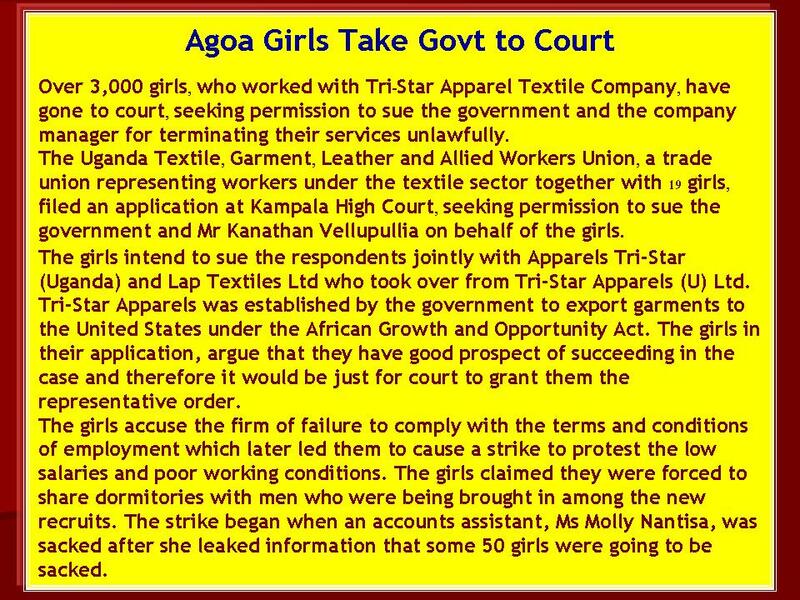 Unfortunately, the NRM Government does much of Government business childish. Imagine people have stolen money over 2 decades but Government has failed to come up with a solution to this great leakage. Continuous extensions of NRM and the changing of the Constitution to suit one person are all childish. Can you imagine at this point in time that someone proposes children going to school with cooked food? Failing to use donor funds for what they have been borrowed for as per the project proposals is childish management of Government affairs. Imagine giving a company a contract and Government is reluctant to see the monthly dues remitted, yet the contract is not terminated. This is all childish. Childishness has assumed a new dimension where Parliament without quorum is committing Ugandans to astronomical loans including the passing of the National Budget; yet the Speaker sees no wrong doing! NRM Government can neither achieve the Mission nor Vision as set for Uganda by themselves. The Vision of NRM is a peaceful, united, democratic, harmonious, industrialized, transformed and prosperous Uganda, within a strong, federated East Africa, the African Common Market and with an African Defense Pact. 1) How do you talk of a peaceful Uganda when the ideas of the people are just shunned? Government is forcing people to foot its selfish line, ignoring the people as the pillar on which government is based. Given this position, peace is simply fragile. 2) United – Government is practicing divide and rule, then how do you talk of united when they are interested in sub – dividing the country as much as possible? 3) Democratic – NRM is not democratic, if it were the position of the Chairman would be contested, but as we hear some one has gone to court because he was unjustly eliminated from contesting for the position. The President would have long left office, but he is using tricks to keep there. There is no democracy worth talking about when donors time and again just threaten to reduce aid for Government to try to foot a democratic path! 4) Harmonious – Government itself is behind the various movements by some people against others. Heard of the Banyala and Baganda, Government is interested in promoting bad co - existence between the two! This is the reason behind the 11th November 2009 riots in Buganda. 5) Industrialized – Uganda can industrialize basing on agriculture, yet government is just waiting for foreign investors to put money where they are interested. The factors that are responsible for industrial growth are mishandled, taxes are wrong, utility costs, name them. 6) The Government wants us in a strong federated east Africa, yet it is against the federal arrangement which people cherish locally! However, given things on ground; that is wrong priorities, out right theft of funds including donors’, the NRM Government is simply day dreaming to get the mission achieved. The best they can do is give way for others who have the will to correct the situation. State House must be disciplined financially. It is unfortunate how every year there are arrears which have been met in the budget of the following year. Imagine a new Government struggling with the monetary indiscipline of the previous one. It is unfortunate that Government has rent arrears not paid to Buganda Government yet when they continue using Buganda Government premises. It may be necessary to remove the facility out of which the President makes donations, it looks misused and or abused and leads to uncalled for liabilities and political favours. State House debts had risen to over sh100b by June 2009. The Ministry of Justice spent sh110b in compensation, court awards and settlements last financial year. The Police do not know the actual staff strength of its force. And sh371b loaned to state and private companies may never be recovered. These are some of the findings in the new Auditor General's report on Government expenses in the financial year 2008/2009. The report was handed over to Parliament last week. 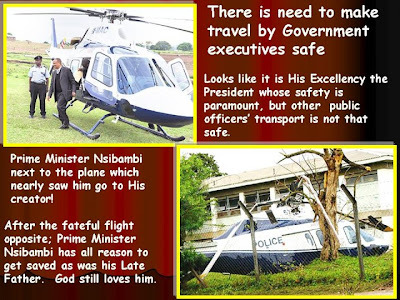 The Auditor General, John Muwanga, in his report noted that although the Government has instituted strict systems to control expenditure, State House has incurred huge debts as a result of the purchase of the new presidential jet. The Bank of Uganda advanced a loan of sh96b to finance the acquisition of the aircraft. According to the agreement, the amount is payable in installments of about sh10b per year with interest.